Do you need a little sprinkling of inspiration to kick start your morning? Well, the heroic story of Usha Kiran, the 27 years old woman CRPF officer of Baster will surely work as a catalyst. Where all the women of villages get raped and assaulted, Usha Kiran is setting up a new image in the Maoist hotbed Bastar. From battling Maoists to protecting villagers from every kind of assaults, the CRPF officer Usha Kiran has earned the name of the real life ‘Lady Singham’ of India. Let us get a little sneak peek of the life of Usha Kiran here. With a blessing of 3rd generation CRPF tie, the early life of Usha has been mostly spent in Delhi. Kiran’s grandfather and father both served the CRPF service. She was born and brought up in Gurgaon. Since her school days, Kiran has taken an interest in every kind of sports events, especially athletic sports. Such dedication towards sports led her to be a national athlete of India, and she represented Delhi in Triple Jump event many times. As much as she loved sports, Kiran opted for something else after finishing her schooling in Gurgaon. 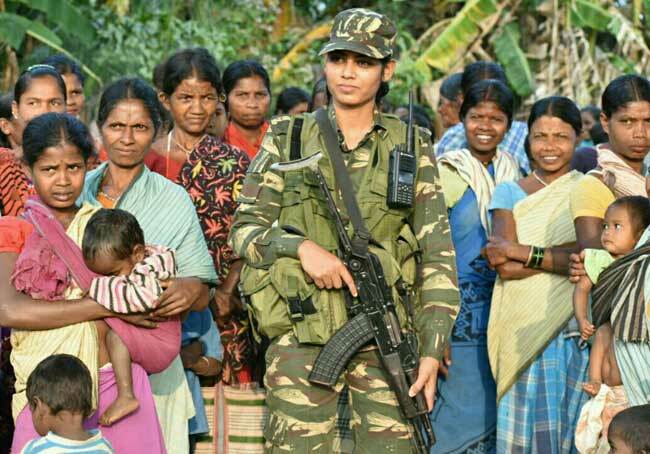 As Usha Kiran has a family history of having CRPF officers, she always wanted to join the battalion and save the poor people from the dread of the Maoists and the terrorist’s activities. She first joined the ‘232 Mahila Battalion’ during her training period in 2013. After she finished her training, she was given the chance of choosing the preferable region to be the officer. She chose either the region of J&K or the North-East of India. However, finally, she was given the Chhattisgarh region, Bastar – A district dreaded with Maoist activities. She did not want to be in the Mahila Battalion anymore, and thus she requested to join the Male Battalion instead. After carefully inspecting her skills, she joined the 80th Male Battalion force in Bastar. Just at the age of 27 years, Usha Kiran has made it to the 80th Male Battalion in Chattishgarh range and that is an achievement in itself. Along with another female CRPF officer, Usha Kiran is the first youngest woman CRPF officer in India. Previously, the villagers of Bastar were afraid of the security force and the male cops. But after Kiran joined the force, they are regaining their trust in the Battalion force. Being a woman, she represents the face of the whole tribal women community of Bastar. Being one of the most sensitive regions of Chhattisgarh, no officers opt for taking the responsibility of the Naxal-hit Bastar region. But Usha Kiran is the one of such instances who chose this region to save the poor village family from the Maoist attacks. Also, this heroic story of Usha Kiran will help to inspire other officers to take up this step of bravery as well. Not only she is a role model for the tribal women in joining the armed force, but in spare times she also helps little school girls with their education as well – a true inspiration indeed!